Some well-know and well studied taxa can often have little bits consistently missing from their fossils and it can take many years before every part of their anatomy is known. In the case of the derived alvarezsaurs it was only very recently that a complete pes was known with the discovery of Albinykus. This was rather unfortunate for me, as it somewhat renders much of my new paper redundant. Yes a couple of years ago while out prospecting at Bayan Mandahu I came across this delightful little alvarezsaur pes. What is nice about it though is that it has digit I intact, something unknown in the clade (well, when I found it and started work describing it). 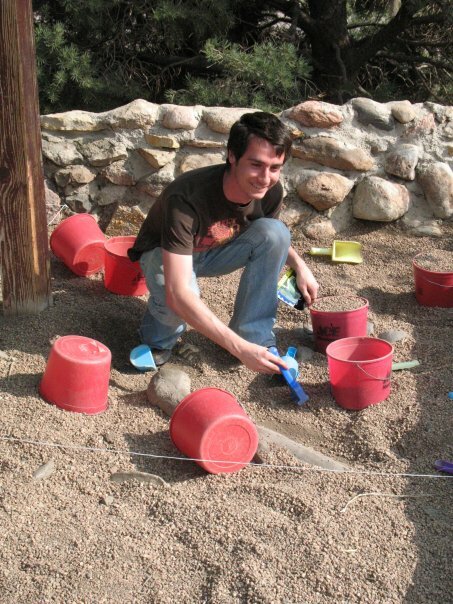 The piece was actually found within a good stones throw of the points where both Linheraptor and Linhenykus were found, so that’s clearly a good spot to be working in. In this case we refer the pes to Linhenykus given the similarity in form and that it was found in the same locality, and perhaps even the same horizon since both the holotype and this specimen were preserved in nodules. So much so not especially interesting perhaps, having been beaten to the punch. True, but we were able to expand our discussion a little in looking at the shape and structure of the metatarsus. Alvarezsaurs like a number of derived theropod groups have a ‘pinched’ metatarsal III resulting in the arctometatarsalian condition. The evolution, structure and function of this set-up has been discussed at some length in a variety of papers, but we were able to provide some extra little details which seem not to have been looked at previously. While it recognised that despite the proximal and posterior constriction, some metatarsal IIIs have a mediolateral expansion – in other words, looking at the front of the element, it can look quite fat a way up the shaft. Our examination of this and subsequently other specimens suggests that this is a thin flange of bone that sits on top of mts II and IV. This doesn’t seem to have been mentioned before (and I was pleased to see that the referees, both of whom have looked at this extensively, agreed with this assessment) and is potentially quite odd. The structure of the arctometatarsus seems linked to running efficiency and reducing motion between elements. However, having a flange of bone here on the anterior face would presumably help stop mts II and IV moving forwards relative to III, or III posteriorly relative to the others, or even both. Only this seems a rather unlikely problem for even a highly cursorial animal. This is clearly beyond the scope of a short descriptive paper to deal with, but it is (I think) an interesting observation. 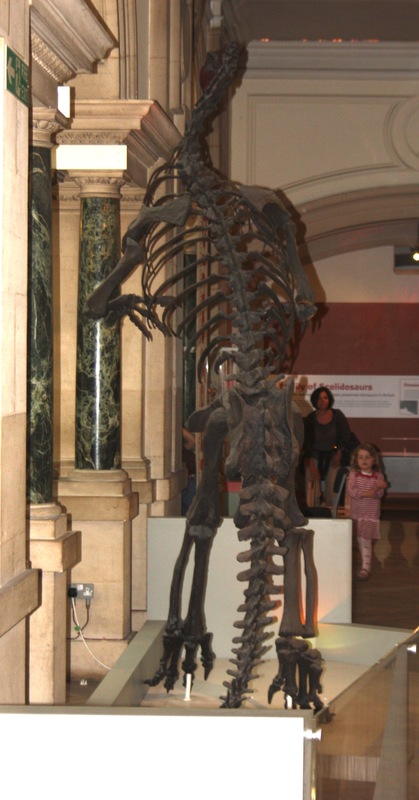 Related to this, the exact shape and structure of mt III in this specimen compared to the holotype of Linhenykus is a little different. One might expect such a derived and specialised condition to be highly conservative which suggests the selection is potentially quite weak on this specific structure. It also hints that there may be more variables and details to the arctometatarsus than previous realised. As a final little note, this paper is out in Acta Palaeontologica Polonica so is freely accessible, though currently as a horrible uncorrected proof, as indeed is the long and detailed description of Linhenykus that follows last year’s brief work in PNAS. Hone, D.W.E., Choiniere, J.N., Tan, Q. & Xu, X. 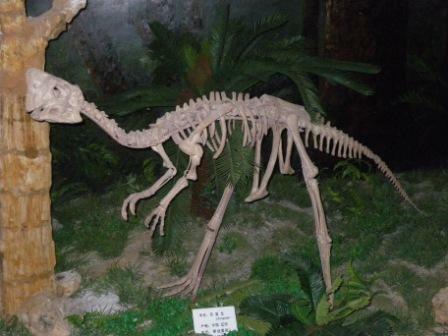 An articulated pes from a small parvicursorine alvarezsaroid (Dinosauria: Theropoda) from Inner Mongolia, China. Acta Palaeontologica Polonica, in press. 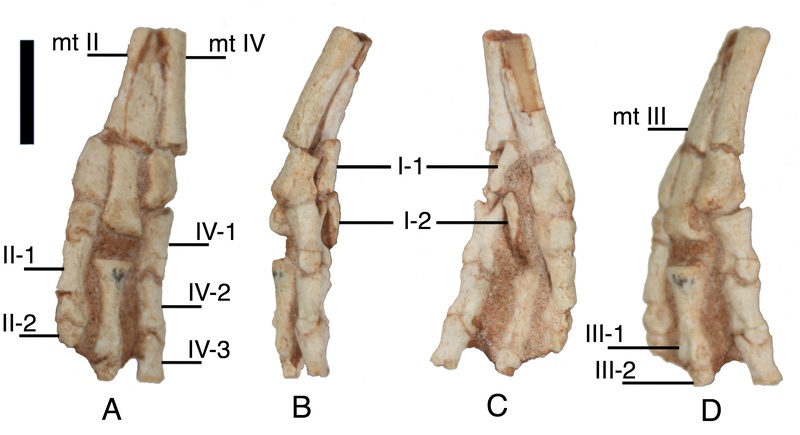 Xu, X., Upchurch, P., Ma, Q., Pittman, M., Choiniere, J., Sullivan, C., Hone, D.W.E., Tan, Q., Tan, L., Xiao, D., & Han, F. Osteology of the alvarezsauroid Linhenykus monodactylus from the Upper Cretaceous Wulansuhai Formation of Inner Mongolia, China, and comments on alvarezsauroid biogeography. Acta Palaeontologica Polonica, in press. This photo was sent to me by an old friend who found it among her son’s collection of plastic dinosaurs. She asked me what kind of dinosaur had a head like a kangeroo on a theropod-like body. My answer was ‘none’ and then the picture turned up. I can see why she was confused! I’m no stranger to dodgy dinosaur toys but this really is a marvel. Taking the head alone it’s hard not to consider it mammalian – the shape of the muzzle, position of the nostrils, the apparent jaw muscles and of course the ears all mark it out as more mammal than reptile. 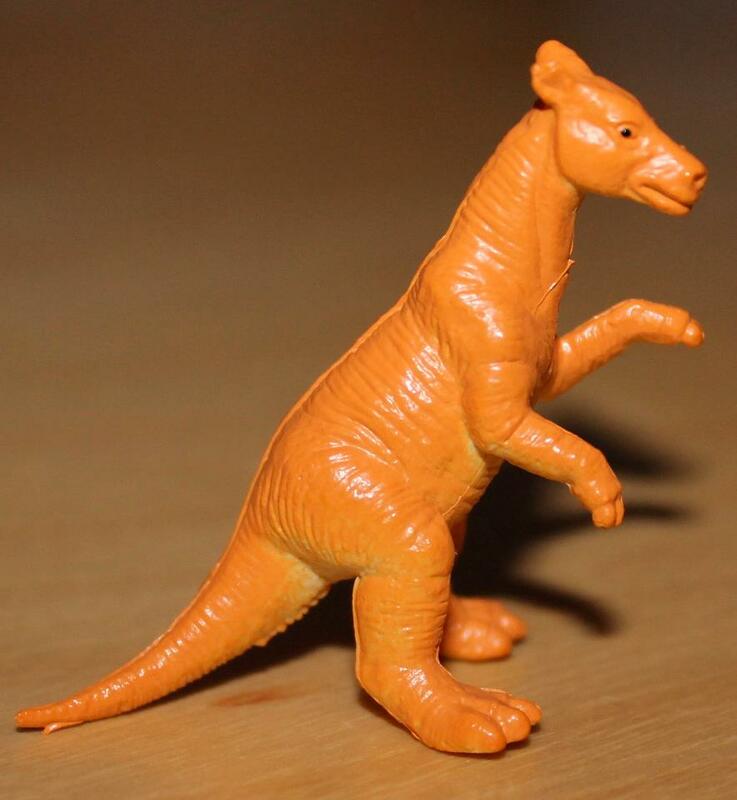 However the body does look dinosaurian, the sculpting of the surface hardly looks like fur, the tail would still be too fat for a kangeroo and certainly for any other mammal, and the feet especially are tridactyl and with big claws. In short it’s hard to consider this anything other than a dinosaur-mammal chimera. Wow. Cheaply made and badly sculpted toys are one thing, but you really wonder quite what they were looking at / taking when this was made. My thanks to Kath for this unique ‘treasure’, for those interested, her blog is here. A digit of the English sauropod Cetiosauriscus. After yesterday’s entry it seemed a good idea to shift subjects a little and this is about as different as I can readily manage at short notice. Sauropods being what they are (an my knowledge of them being what it is) I’m not actually sure if this is manual or pedal, but well, it’s nice enough as sauropod digits go. A few years back I wrote a post entitled ‘Tyrannosaurus vs Giganotosaurus’ as I happened to have permission to post a lovely photo comparing the skulls of each and a leftover image of my own of various big theropods. Perhaps inevitably this has been my most viewed and most commented on post ever, and it’s one that’s regularly thrown up by searches, generally involving Spinosaurus too. However, oddly enough much of the ‘discussion’ and views seem ultimately to be simply about big and bad carnivores. Ask a biologist is not immune to the obvious desire for people to know about large predators and their ability (or otherwise) to beat up other carnivores. Now from the perspective of a palaeontologist / biologist my answer is generally a simple one – who cares? These animals never met and could not have done so. Even IF they somehow managed it, they would almost certainly not engage in any kind of full on fight to the death. Even if they did, what would that tell you really? I’m sure there were bigger adult rexes than the smaller Giganotosauruses say, but bigger G.s than the smallest Tyrannosaurus individuals. So you have to compare theoretical maximums or averages, but that may not mean much if you’ve ever seen a hyena go for a lion or wolverine go for a bear. Big is not the same as bad, let alone victorious. None of this will tell you anything about the animals at all, their biology, evolution, life history, lifestyle, ecology or behaviour. It’s an understandable preoccupation for kids and while I don’t think it’s worth the hassle it can be a window into further thoughts and interest. Which do you think would win? Why do you think that one would win? Could we look at any of those things in fossils? 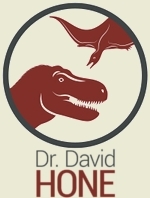 Bite marks, bite strength, mass estimates, tooth shapes, eyesight, acceleration, intelligence – all of these things have been written about seriously by palaeontologists and zoologists with all manner of detail and information available. Reasonable inferences can be made by looking at living species and how they behave (what do different predators do when they encounter one another?) not to mention variation within species about how they are built and how they might act. The question might be mundane, even vacuous, but there’s much that can be discussed and more importantly learned, if the question is a hook to expand people’s horizons and interest. Now to sit back and wait for all the comments of “But t. rex wud win coz he is THE KING!!!”. Well the SV-POW boys won’t do too well out of this as its rather vertebra-light, but here are a bunch of details of the Plateosaurus mount I showed yesterday. 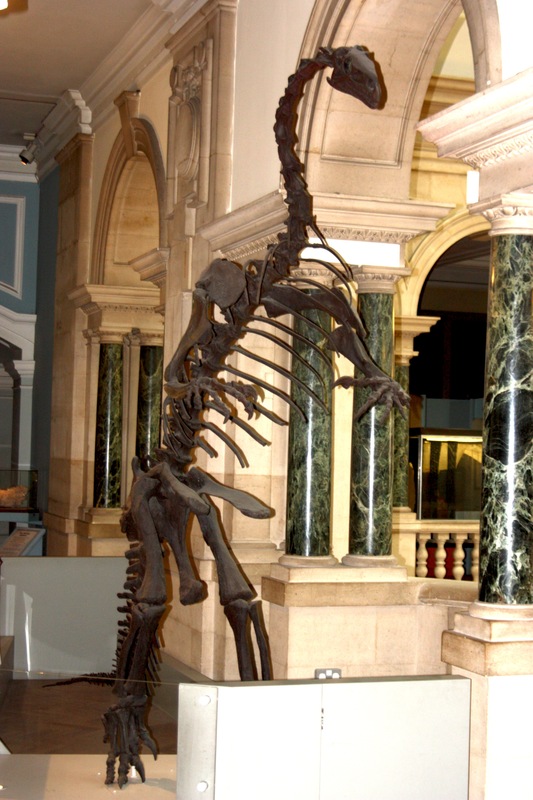 Not that I have anything against Plateosaurus I should stress, but in the way that every zoo seems to have Asian short clawed otters, meercats and (these days) Asian lions, so too do you get a bit bored of some features in museums when you have been to so many of them. While casts of the Berlin Archaeopteryx seem to have infiltrated every Natural History Museum known to man (well known to Dave anyway) the only decent-sized dinosaur I’ve seen too many of is Plateosaurus and the 5th or 6th mount tends to pale a bit when you have had time to play with the original bones, and have seen the massed ranks on display in Stuttgart. This one is in the Bristol Museum and is featured here simply because it’s the one mount of the genus I’ve been able to take decent number of photos of with a decent camera. I’d say more, but well, with Henirich now blogging, I’m really not sure I can say anything about this guy that he hasn’t already said or won’t say better. Lots more photos to come tomorrow of various views of parts of the skeleton, but it seemed best to start with a couple of general views. Papers that act as summaries, syntheses of data, or basic, outright reviews are both important and successful parts of science. The prominence and importance of journals like the Quarterly Reviews in Biology and especially Trends in Ecology and Evolution shows their relevance, and let’s not forget that classic academic texts like The Dinosauria or Romer’s Osteology of Reptiles are more or less reviews of the existing literature. Yes of course there are new interpretations tacked onto these and corrections made to taxonomies, anatomy and the rest, but mostly they are a compilation of the most important and significant papers on the subject and present a consensus view of the current scientific positions. Reviews are really useful. After all, it’s impossible or at least exceedingly hard to dive into a new subject (or even keep up to date effectively, or simply refresh your memory) from scratch. This is true of course for academics, but also for students of all levels, technicians and the general public – we all have to start somewhere. Review papers (in general) provide a foundation on a subject, giving the first principles of the issues at hand and the outline of what is known and how and what it means. It is not an end in itself, anyone with serious pretensions to work in that subject should be reading much further and wider, but this will be the place to start and of course provides a great resource for a given topic. However, oddly it seems an awful lot of journals don’t really like publishing them. While there are dedicated review journals out there, my recent experiences with them is that they are overflowing with submissions or requests by people to produce submissions, so clearly lots of people are writing them or want to write them. The huge interest in things like TREE and the massive citations accrued by papers in them or something like the Dinosauria shows people are using them. However, a great many journals simply say that they will not publish reviews, or review-like manuscripts (or similarly useful things like catalogues of specimens, lists of localities or whatever). We seem to be in the odd position where people want to write something, readers recognise their value, they are widely used and cited, but the journals don’t want them. Moreover, even the review journals can be difficult when it comes to reviews! A paper of mine was ultimately rejected from QRB because one referee demanded that we include new primary data and an analysis of this. I don’t disagree that a review can still contain new data and new ideas, but really? A review paper in a review journal has to contain new work and analyses? Even those that do publish seem to go in for either the tiny (TREE papers are just a few pages) or the monolithic (Annual Reviews in Earth Sciences) with little scope for something say in the 10 page range. A few more journals willing to accept such manuscripts or even a couple more journals dedicated to reviews would seem to benefit all and sundry and I for one hope this can be encouraged. The presence of a latitudinal biodiversity gradient (LBG), whereby species richness is highest in the tropics and declines polewards, is a pervasive pattern affecting the majority of life on Earth today, and was recognised by early naturalists such as Charles Darwin and Alexander von Humboldt (whose foundation coincidentally partly supported the research outlined below). Despite its near ubiquity (on both land and in the sea), the causes of the gradient are less well established, with numerous hypotheses proposed over the last fifty or so years. Most of these have been refuted, leaving climate and the distribution of area as the two most likely causes. Understanding the cause and evolution of the gradient is vital to predicting biodiversity loss driven by present-day climate change and explaining geographical variation in biodiversity; as such the fossil record offers a unique perspective on this issue. Previous work investigating the deep time LBG focused on marine invertebrates – these studies tended to find support for a modern type pattern throughout the Phanerozoic (approximately the last 530 million years). Little prior work has been carried out on terrestrial species, but the few studies to look at the deep time LBG on land found no evidence for a modern pattern until after the Eocene (approximately 30 mya). Along with colleagues from the UK (Roger Benson, Paul Upchurch, Richard Butler and Paul Barrett) and USA (Matt Carrano), we looked at the LBG in Mesozoic dinosaurs (including birds). Using a number of different methods to mediate for sampling biases in the fossil record, we found no evidence for a modern type pattern at any point in the 160 million year evolutionary history of Mesozoic dinosaurs; instead we found dinosaur diversity to peak at palaeotemperate latitudes (30-60° North and South). 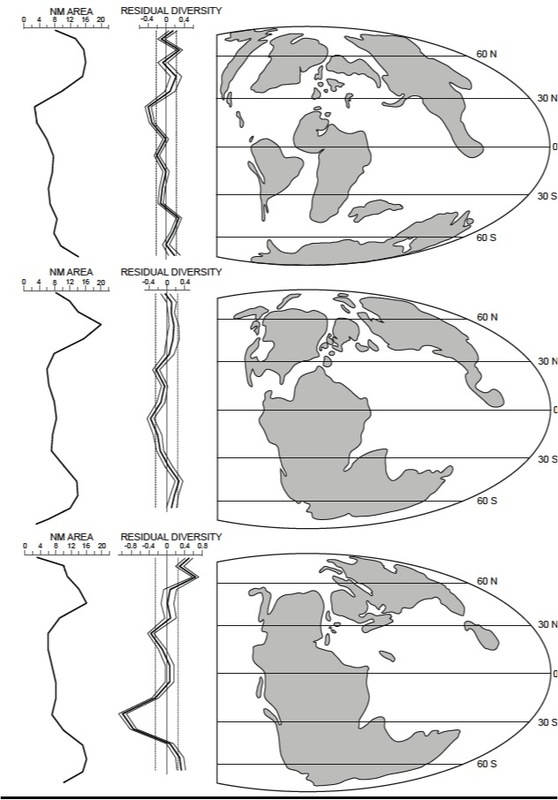 The consistency of this result across analyses for different time slices indicates that this pattern is not controlled by climatic fluctuations – evidence suggests that the climatic gradient was “flatter” in the Mesozoic than today (i.e. there was less of a difference in temperature between tropical and temperate regions) – but was instead driven by the amount of available land area in latitudinal belts. Given that living birds conform to the modern day pattern, a significant change must have occurred at some point in the last 65 million years. Evidence from molecular phylogeny (and work on fossil insects) suggests that this change occurred at the end of the Eocene (34 mya), following the strengthening of the climatic gradient and an increase in seasonality. As such, there is no evidence for a modern type LBG on land before the last 30 million years. I was lucky enough to have access to quite a good osteological teaching collection in Dublin. Sadly though, the accessibility of it meant I never got around to taking good photos of much the better material and only have a few shots grabbed at the last minute. One of them was this of Apteryx, a kiwi. 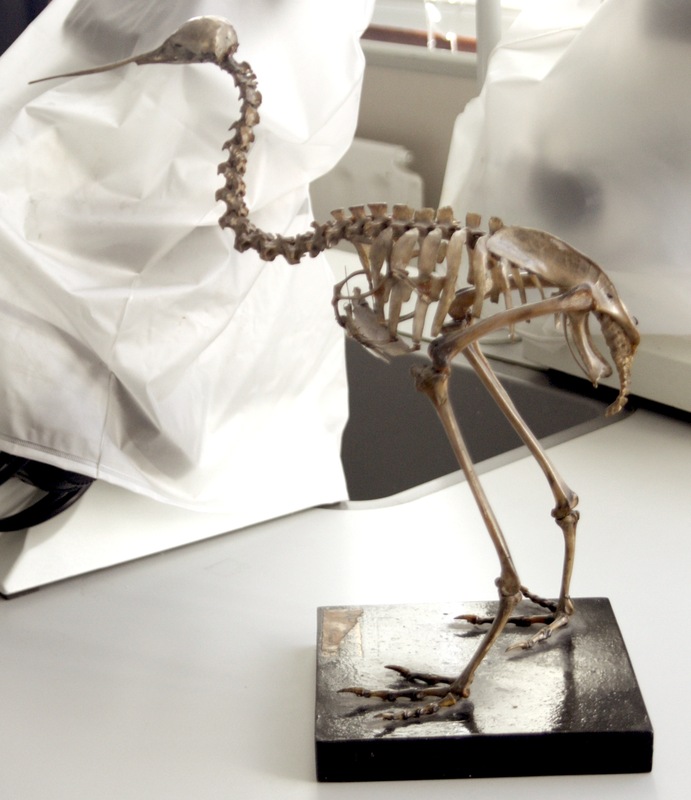 While I’m not a big one for covering extant taxa (well, as specimens, obviously the live ones often put in appearances) the kiwi is on my mind having been completing a bit of work on alvarezsaurs recently. Clearly the two are not that close, but the tiny remnant arms of the kiwi made me think of them and that’s enough of a reason for it to pop into my head and thus onto the Musings. So here it is. A rather different oviraptorosaur to the last one, though I’m not sure what this is either. It was (I think, I saw this two years ago) labelled as Oviraptor, though the oft confusion in terms of separating the very similar Oviraptor from Citipati and the general low quality of the mount makes me suspicious that this isn’t what it says it is and my lack of knowledge over the distinctions between the two means I might not know. Anyway, as usual lacking any evidence to the contrary, I’ll go with Oviraptor. Incidentally, the mount is in one of the endless small museums down in Liaoning. There are so many in fact, I can’t remember exactly which one this is, though I think it’s the main one in Jinzhou. This is the skull of the Middle Jurassic tyrannosauroid Guanlong, the crested dragon. Or more specifically it’s the skull of the referred specimen, a near complete juvenile animal that’s in nearly as good condition as the adult. One thing it lacks though is the famous crest of the genus. While this could be put down to ontogeny, a look at the skull in dorsal view shows obvious signs of damage and there was most likely some form of crest here originally, though probably rather less well developed than the adult. 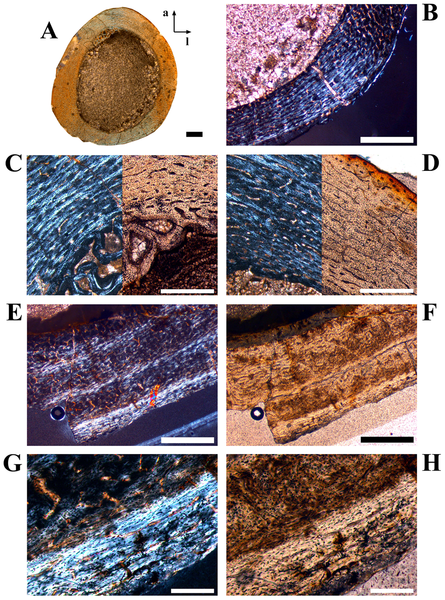 Today Tom Hübner takes us through his recent paper on the bone histology of Dysalotosaurs. This little ornithopod is a close relative of Dryosaurus (pictured here) but unlike the US Dryosaurus, comes from the famous Tendaguru beds of Tanzania. This is a great piece of work to see for me as Tom started this work for this PhD thesis in Munich while I was there and so I know the long hours and hard work Tom put into this and it’s great to see it come to fruition. Many of you might know it already that I finally got a rather long paper on the bone histology of a small ornithopod dinosaur (Dysalotosaurus) published in PLoS ONE. 29 pages sounds like a lot but I wanted to break with tradition a bit to publish only as brief a paper as possible. This had something to do with the beginnings of my studies on bone histology because most papers at that time restricted the information to the most necessary facts which was quite difficult to follow and reconstruct. Without the personal help of ‘experts’ I never would have understood all that. Another reason for the length of the paper is the enormous variation in the microstructure of the bone. Many times I was struck by a completely different type of tissue and it needed some time to identify them and sort them out. That’s because ‘variation’ is also one of the three main topics of the paper. Anyway, for everyone interested in bone histology, I think it is worth reading [seconded, it’s a great review as well as providing new information and analyses]. 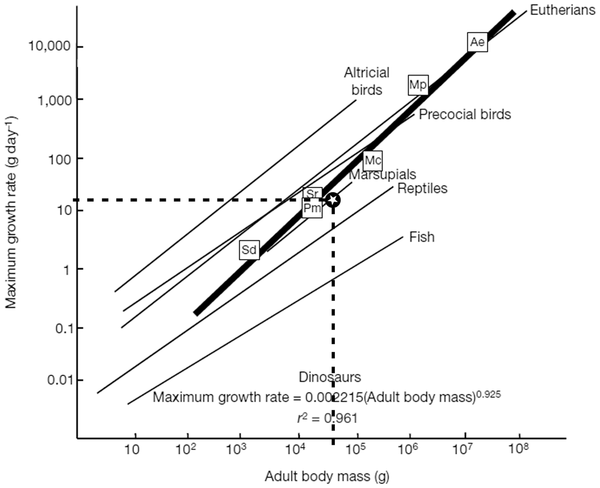 The most important aspect is the usage of a new type of growth cycles for life history reconstructions which might be applicable for other vertebrates as well, especially when they lack lines of arrested growth (LAGs). Some might wonder why such a small animal delayed sexual maturity until about its 10th year of life because it should suffer many losses by all types of predators. Well, that’s a good question and difficult to answer. One strategy is definitely the precocial breeding strategy, but the predators could also be the reason for delayed sexual maturity. The animals would not start breeding until they were large and strong enough to withstand the additional stress of mating and breeding, and they still had at least 5 years for reproduction because, according to the size-frequency distribution, only after about 15 years of age decreased their abundance within the herd significantly. Large ornithopods, on the other hand, had the opposite strategy (see Cooper et al. 2008) by outgrowing predators in a short time. Most of them also had altricial breeding behavior. This, and other arguments presented in the paper, could be a good non-phylogenetic difference between small and large ornithopods in general, but there is still much do to before this can be a strongly supported theory. As always: “More fossils and more studies …”. Constructive criticism is always welcome, so don’t hesitate to post them. I’m still not at all too old to change my mind. Well, this is science – nobody can learn something new without knowing where the mistakes are. 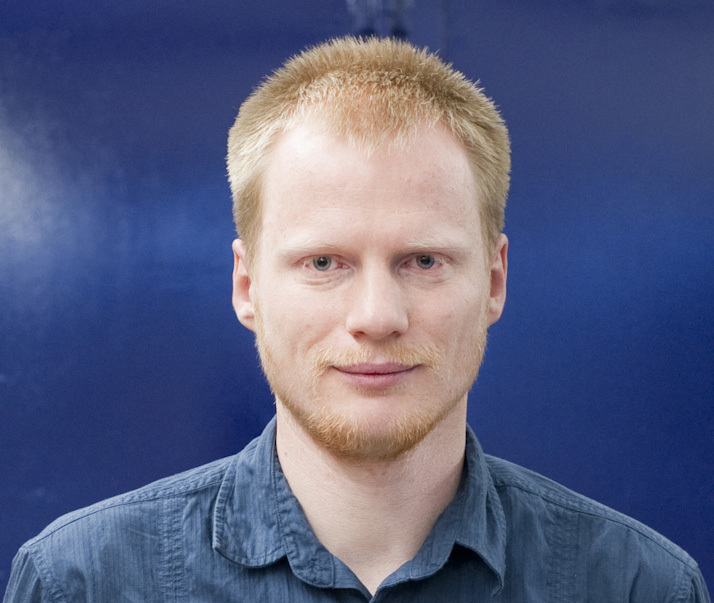 As this is in PLoS ONE, the paper is freely available here.